One thing that sticks out to me about this wedding is the fact that my GPS took me to the middle of nowhere with nearly zero service and gratefully I finally called Meghans, spoke with her mom told them what happened and literally NO ONE cared. Meghan didn't care, her mom didn't care, the bridesmaids, no one cared that I was nearly 20 mins late. And the moment I walked into the door I knew why, because they were brimming with excitement and smiles and joy that filled the room. Little details or timelines were not going to ruin this day. That made me love it the most. Because they (Bride and groom and parents) didn't care about anything except getting married. This day was about marriage and a family coming together and nothing else. It just really sits with me because sometimes I feel like that can get lost on a wedding day. I feel like the big picture can get lost in the details, the decor, the timeline, the "stuff". Meghan and Joe cared about the BIG picture. I love what they have to share with you all! Joe's point of view is such an added bonus! Meghan: My favorite memory was the time Joe and I had alone together between the ceremony and reception. We opted to drive Joe’s parents’ Corvette on our wedding day rather than getting a limo or bus for the whole bridal party. I was nervous that I would regret this decision and want to have everyone together on the drive to the reception venue, but I’m so glad we did it this way. Joe and I had time to gush about how excited we were and to reflect on the ceremony. It was a really special 20 minutes! Joe: The moment we said “I do.” That’s the most important part! Meghan: When creating your plan for the wedding day, add extra time for each part. I am so glad I did, we were consistently running ahead of schedule, which took loads of pressure off of us. As a result, we were able to live in the moment and relax more than I believe we would have otherwise. Joe: Hire a good photographer! Seriously. The pictures we have are such good representations of us and they bring back memories of the day. And I’m not just saying that because this is going to Dani. Meghan: We booked our venue and photographer first. I knew (for years) before we began wedding planning that I wanted Dani to be our photographer, so once we could nail down a date and location we contacted her! Joe: Book the venue first. Also, lock in the caterer sooner rather than later. That got us a lower price than it would have been if we waited until the year of the wedding. Meghan: I was nervous about EVERYTHING. I was literally pacing around my parents’ house thirty minutes before the ceremony thinking about any tiny thing that could go wrong. All of that worrying was a waste. Because we hired trusted, experienced vendors, the day went so smoothly. Joe: The weather, falling during the ceremony, dumb stuff. It all worked out in the end! Meghan: Make wedding decisions based on you and your fiance’s tastes, not trends. We tried to inject our tastes and style into the day as much as we could. We had mac and cheese with dinner, mini pies instead of cake, and used a lot of greenery instead of flowers. Weddings are expensive, so spend your money on what truely makes you happy. Joe: Do it right! You’re only going to do it once. Meghan: I am so happy to say that I wouldn’t change a thing. It was the perfect day. Joe: I can’t really think of anything I would change. Meghan: We shopped for dresses at Vera’s House of Bridal in Madison. My mom got her wedding dress there almost 30 years ago, and I thought it would be so special to follow in her footsteps. I knew that I wanted my dress to be fitted and lacy. I went with the dress I felt prettiest in! I wanted my bridesmaids to have the same exciting experience of choosing something that made them feel good, so I told them to choose any long dress they liked. Then, we ordered their dresses in shades of blush and mauve. The result was gorgeous! I stayed organized by using the checklist available on theknot.com and spreadsheets on Google Drive. 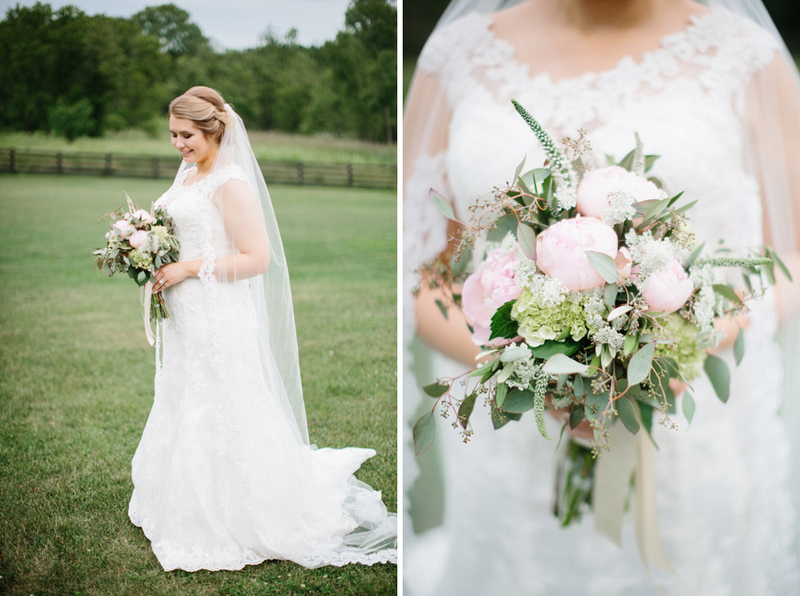 The Knot helped me to remember tasks I would have otherwise not thought of, and I used the spreadsheets to list decor items I purchased, plan and keep track of our budget, and create a detailed schedule for the wedding day. 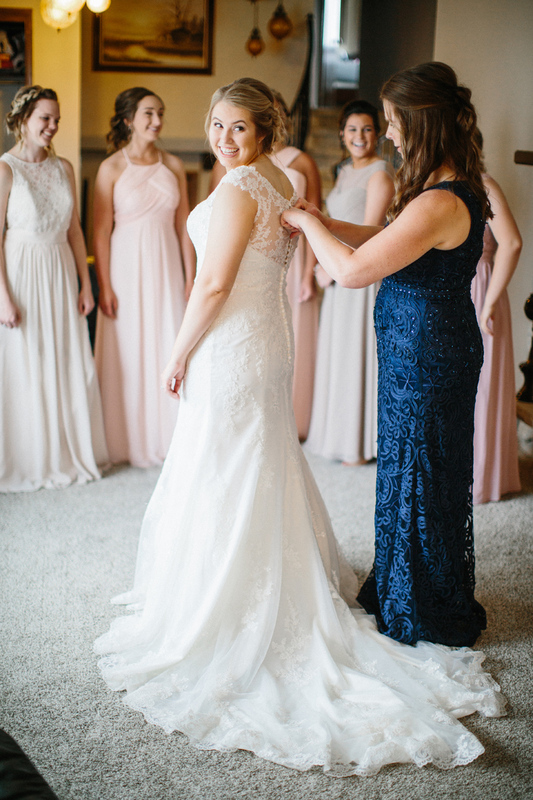 The schedule spreadsheet was especially helpful because I shared it with my wedding day coordinator, and she and her assistant used it to keep the day running smoothly. Joe: My wife kept me organized. Meghan: Above all, enjoy the process and the day! Marriage is beautiful, weddings are beautiful, family and friends witnessing your love is beautiful—so live in the moment! Also, find comfy shoes. 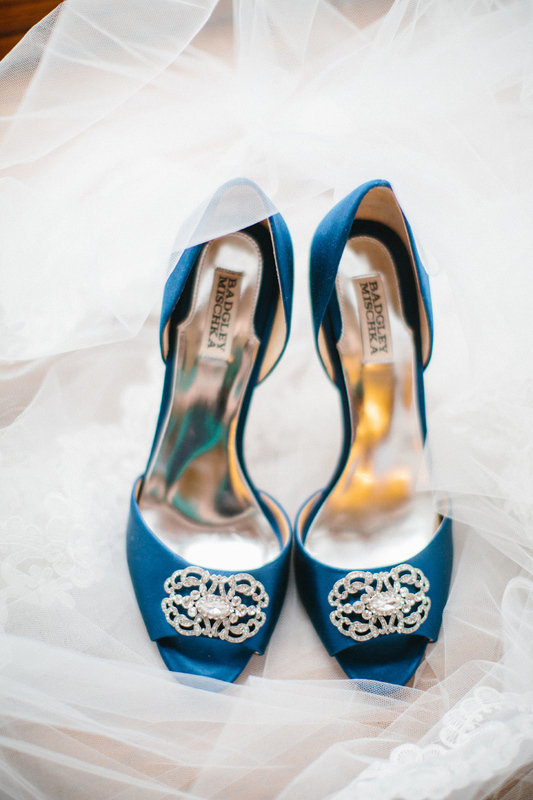 Or have really uncomfortable designer shoes for the ceremony and then put on Target sandals immediately after. Joe: If you have an idea of something you want to build or create, just do it! We made our wedding centerpieces by cutting wood rounds from a tree at our cabin. We had a lot of compliments on them.